In previous posts, I referred to your body as a black box or a bag o' chemicals. The idea is that whatever you think, whatever you do, whatever actions you take or words you speak are initiated by chemical reactions in your body. It is an easy step to go from there to ...therefore, a healthy body gives you a healthy mind. I have recently had an intense focus on getting my body to a healthier state. There are two parts to that: diet and exercise. This post is about diet. A recent book, Good Calories, Bad Calories by Gary Taubes has rocked my world. Taubes has researched and documented the history of obesity and nutritional research since the mid 1800s. What he has revealed in the book is the likely cause of the slow motion train wreck of obesity and diabetes in the United States. 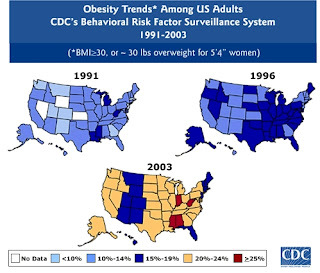 As you can see in the maps to the right, the incidence of obesity in the US has increased greatly since 1991. Diabetes, hypertension, and other chronic syndromes have followed similar trajectories. Taubes has documented how and when the thinking about good diet changed from the idea that carbohydrates (especially highly processed carbohydrates) make you fat, to the current concept that carbohydrates are good for you. 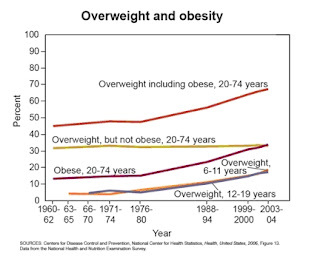 On the line graph, obesity increases starting in the mid-1970s when George McGovern announced the publication of "Dietary Goals for the United States." This publication marked the beginning of the carbohydrate age. The American Heart Association began pushing a low fat, low cholesterol diet, and the USDA did the same. In recent years, there has been an important paradigm, that weight change/obesity is driven simply by calories in minus calories out. Proponents of this paradigm cite the first law of thermodynamics. Their thinking is that energy in (what you eat) and energy out (what you use) are the independent variables with delta E being the simple difference between the two. Taubes contends, with an enormous amount of reference material, that the composition of your diet actually drives the delta E, then your body does what it needs to do in order to either "force" you to eat more (by triggering hunger pangs for example) or by changing your base metabolism or activity levels. The laws of thermodynamics still apply. It's just that your body changes its requirements dynamically. In this model, obesity is not a failure of willpower or laziness (gluttony and sloth), but rather a biological imperative. It treats the body and metabolism as not just a calorie counter, but as a metabolically active organism. This perspective is more consistent with the results of multitudes of studies than the inert metabolically static model. This bothers many people, because their belief is that obese people just don't care about themselves. Nothing could be further from the truth. We all know overweight people who eat tremendously low calorie diets and are unable to lose weight. Of course even when they go off the diet, they gain it right back and more. Nutritionists have long known the following: Carbohydrate consumption drives insulin secretion. They also know that Insulin secretion drive fat deposition. These are known facts. As engineers you know that this is logically equivalent to "Carbohydrate consumption drives fat deposition." So eating that tends to drive insulin secretion will tend to cause deposition of fat. This is known and has been known for a very long time. In general, all else being equal, lower calorie intake will result in lower body weight. In an uncontrolled caloric environment (i.e. the real world), higher levels of carbohydrate ingestion will trigger an insulin response in your body, which will then leave your body craving more food. Repeat this many time and the cells of your body become insulin resistant, which will drive higher levels of insulin secretion. This leads eventually to metabolic syndrome, symptoms of which are diabetes, high blood pressure, central obesity, decreased HDL level, and elevated triglycerides. You can also get increased uric acid levels in your system, which can lead to gout. The point is not strictly that carbohydrates are bad for you, but rather that the people who have been claiming that carbohydrates are good for you have done that without regard for basic scientific principles. And by the way, there is a preponderance of evidence that indicates that excessive carbohydrates are bad for you. I had gained almost three pounds per year since I graduated from college in 1979. I have tried diets from time to time as well as exercise. What I found was that when I would try to do both, after a short time, it was really hard for me to exercise. I would become sluggish and feel unmotivated. In late 2007, I decided to learn about this stuff and really make an effort to become a better animal by becoming more fit and losing body fat (not just losing weight). A bout with gout right before Thanksgiving really motivated me to learn about nutrition. I started digging into website of people that I was familiar with. One of the first was Lyle McDonald's body recompostion website. Lyle is a science nerd who really likes to pore through research and extract the relevant and important information. This was a really good start. I learned a few things on this. First make sure you get enough protein. Try to consume at least 1 gram of protein per lb of body weight (this is a lot of protein). Second, you can cut up to 31 calories per pound of body fat out of your diet and lose minimal lean body mass. This Gary Taubes lecture at Berkeley contains the basics of what is in Good Calories, Bad Calories. Paleo diet websites - These are all a little different in what they consider to be appropriate diet. I think they all favor lower carbohydrates (especially no grains). Disclaimer: I am not a doctor or trained nutritionist. If you are contemplating changes in your diet or exercise, you should first check with a doctor. I also recommend that you learn about fat and carbohydrate metabolism, as I suspect that many doctors are not up to date on all those topics. Remember in all this, your mileage may vary. 1. Exercise is good for you, but it will not be the biggest driver of weight loss. It is important for your health and well-being to do both aerobic, resistance, and flexibility training. a. Eat plenty of protein. Somewhere around 1 gram of protein per pound of weight seems like a good number. (note: if you have problems with your kidneys, check with your doctor first). b. Eating fat is OK. Stay away from trans fats generally. c. If you are trying to lose weight, cut back on (primarily) carbohydrates to the tune of about 31 calories per pound of body fat. In my case, when I started out I was about 230 lbs at 20% bodyfat. I cut about 1200 calories per day. I could have cut more (230 * 20% * 31 = 1426), but this seems to be working. I'm losing so far about a pound per week, with very little decrease in my resistance training abilities. So far I'm down about 20 lbs. Use a Tanita scale or get a fat caliper measurement to determine your body fat. d. Do not add sugar to food, stay away from sweets in general, and do not drink sweetened soft drinks. Even artificial sweeteners can elicit an insulin response. e. When you do eat carbohydrates, generally try to stick to vegetables and fruit. Nuts are OK too (not sugared ones though). So, take care of your body, and keep yourself in a place where you want to be physically. If you do that you will have a better chance of being emotionally healthy as well. Dude, this is an amazing post. So clear concise and well written---this english major is duly impressed. You've sold me on reading the book as well. This seems to be putting an awful lot of weight (yeah, I know, a pun) on the proportion of macronutrients. It looks more like a correlation to me. Consider other things that also happened during that time, such as the explosion of media outlets (when I was a kid there were only like 5 channels, and definitely no on demand or VCRs); the proliferation of PCs and internet use; the movement of more and more of our country's population to the suburbs (which led to more driving for errands/commuting and cut down on incidental exercise); the increase in portion sizes (when's the last time you saw a 6-oz soft drink) and overall calorie consumption. All of these seem more likely to be causes of America's obesity and not just correlated. That is a correlation, which we all know proves nothing. It does give you potential leads to investigate. Many studies have found that exercise does not cause weight loss (although it can apparently help with body composition). The hypothesis that changes in diet, especially refined carbs and/or high fructose corn syrup is pretty well documented in the Taubes Berkeley lecture. I encourage you to listen to it. Taubes makes a pretty good case that the changes in compostion of the diet, especially refined carbohydrates is the cause of increasing carbohydrate consumption, rather than the simple more calories = more weight hypothesis. It's not intuitive, but worth a listen.